Do I sound smart/capable/experienced enough? Uh-oh. What did he just ask? Worry. Fear. Self-consciousness. These are your arch enemies in your goal to nail the interview and get that job. But how do you make each interview the best you’ve ever had? I know enough to do this job well. I believe in the interviewer. You know the typical interview cadence: they ask, you answer, they ask, you answer until you hear, “Do you have any questions?” Then you ask, they answer, you ask, they answer until there are no more questions to ask or you run out of time. Instead, create a new rhythm to the conversation: they ask, you answer…and then you ask something related to what they asked. Break up the typical pattern. Intersperse your questions throughout. Stay focused on the present situation, listen actively and concentrate all your attention on being genuinely interested in what the interviewer is saying. If you’re confused by something they mentioned, don’t just let it go. Ask qualifying questions and be curious about the information being shared. If you’ve prepared well enough, you’ll be able to take what you’re hearing and evaluate it against what you need in this job. This enables you to ask things that will help you assess if this is the right opportunity for you. You may also notice that the interviewer asks you about something quite obscure on your resume. Maybe it’s one of your interests or an area of competency with which most people aren’t familiar. This is a huge hint–odds are the interviewer has this same hobby or deals with this kind of work in their own position. Don’t let this clue pass you by. Pick up on it and ask if they also finds it to be an area of interest. Keep expressing your enthusiasm for the work, the position, the organization and the interviewer. Always return to your answer to the sometimes unspoken (but always key) question, “Why should I hire you?” Communicate your specific talents, passions and skills in specific, concise and positive ways. If you’re in there for the interview, you already have the basic capacity for the job. Now you need to build a relationship with the interviewer. People hire people they like, feel comfortable around and would like to interact with on a daily basis. You know you’re on the right track if the conversation is cordial, respectful and interesting for both parties. He or she will respond positively to you and pick up on your own positive energy. You know it’s going really well when the interviewer begins to share ideas and suggestions with you about how you’ll be able to utilize your passions within the organization, speaking in present and future tenses. And even if this opportunity ends up not being the right fit, interviewers who hear your insight and excitement about the field are more likely to give you additional ideas, resources and even people to network with. Show some compassion. In all likelihood, this person was just tapped to conduct the interview, maybe interrupting what they thought was going to be a productive day. Express your sympathy by saying something like, “My apologies if this interview is getting in the way of your regular responsibilities. I appreciate your time and attention today.” They probably didn’t realize they were taking their irritation out on you. By being considerate of their situation, you can bring them back into the conversation in a gentle and effective way. Take the bull by the horns and tell the truth: “As you’re describing this job, I realize that it isn’t a good fit for what I’m seeking. I don’t want to waste your valuable time.” The interviewer’s next question will most likely be, “So, what are you looking for?” This gives you a chance to share your enthusiasm and passion for your vision. Many times over the years, our career counselors at Centerpoint have heard feedback from clients about instances when this happened. In some, the interviewer gave them some useful advice about other opportunities in the field but outside their company. Others have found that the same employer called them back when a more appropriate position arose. There have even been times when a business created a brand-new position especially for that candidate. Their passion was that contagious! Take a deep breath, shoo those pests away (you can even set up a physical cue for yourself ahead of time, like briefly brushing your pant leg or skirt), and remember to shift your attention back to the present moment. The fear creeps in when your focus is somewhere else. Guess what? When I’m concentrating only on how I’m doing, then I do make those mistakes. If I can instead focus on the listeners with the intent to connect my words in a way that makes them respond positively, then my jitters disappear. Then it’s not just about me; it’s about what I’m able to give and share with others. If you flub something, correct it if you can, then let go of it and move on. Stay completely in the present. Don’t think about the future (“Will I get this job?”) or the past (“Did I prepare enough? Are they going to ask me about that gap in my resume?”) Breathe and come back into the room. Presenting your kindest, most authentic and capable self will benefit you in the long run as you establish long-term professional relationships. With the current volatility of the job market and the frequency of shifting jobs, these connections will be helpful both to you and to your interviewer. 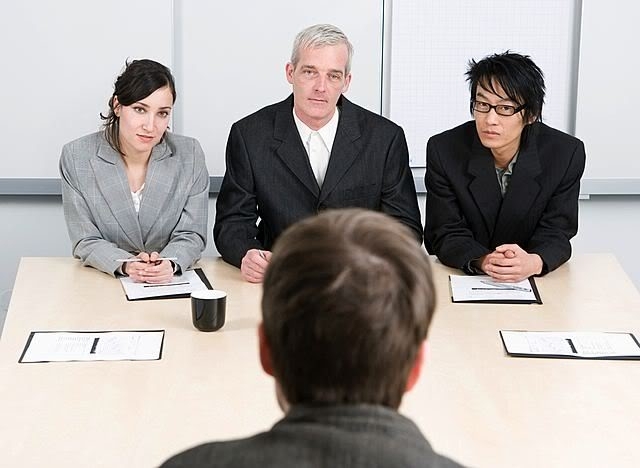 Remember that not every interview will result in a job offer. Every interview is, however, another opportunity to get closer to finding your fit.